We left Jacksonville intending to have a short day and spend the night in Fernandina, FL. After calling the marina, we found it was booked by a yacht group and had no vacancy. Turned away, we headed further north and landed in St. Mary’s, GA (crossing a state line is always good). We got in early – before 3 pm but feeling a bit beat up. Two days of 30-knot winds and a near crash landing on the dock. The currents were so strong that our boat ended up being docked on the starboard side, rather than the intended port side where all our lines and bumpers were. Five people on the dock all yelling different directions and trying to fend us off the dock and avoid our bowsprit being slammed into a piling. We finally got in. “Well, you made it,” someone commented, which really is the bar for getting in ok – do you still have all of the bodies you left with and is there any damage to the boat? If not, it’s all good. 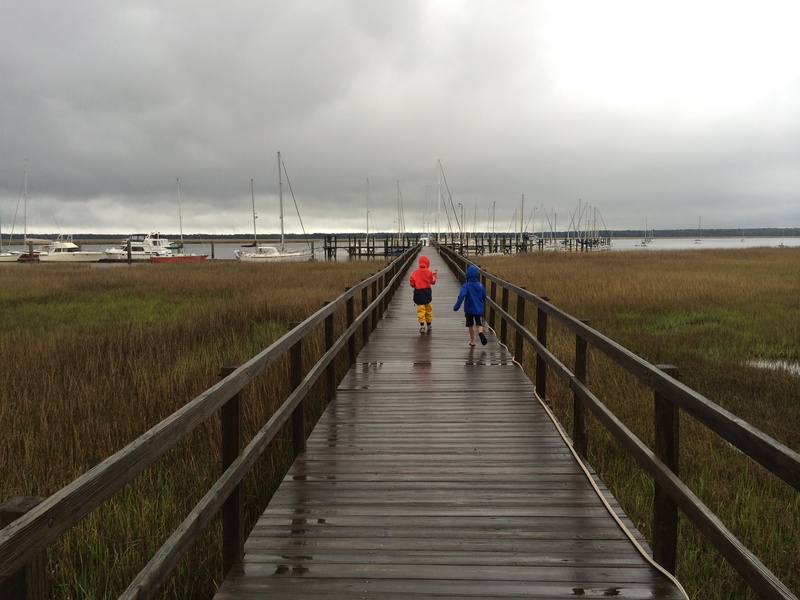 for the general public – just for the marina.” I peeked in on them on our way back to the boat. Oh, how I miss Hammock Beach! They are the kind of showers where you don’t let your skin touch any surface, lest whatever is growing on those surfaces ends up growing on your skin. The fact that there is a lock-coded door to keep people from getting in rather than large BIOHAZARD signs posted to keep people out is a bit hysterical. After the boys did some schoolwork, we spent the rainy morning doing artwork. 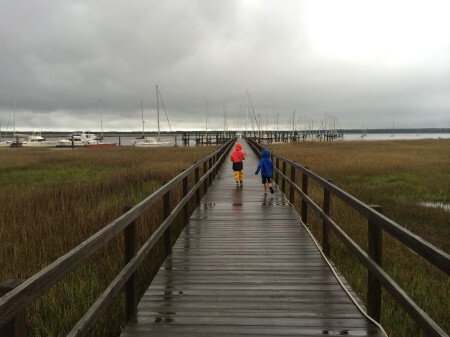 After lunch and quiet time, cabin fever was hitting so we donned our foul weather gear and headed into the small town. This entry was posted in Uncategorized on April 26, 2014 by Diane.